It’s been noted on many occasions, including in her SoulTracks biography, that Lizz Wright shares a history with plenty of other R&B, soul and jazz singers of singing in the church. Her father served as music minister at the church she attended in a small Georgia community. What differentiates Wright from many of the predecessors and contemporaries who in some cases have achieved greater mainstream celebrity and commercial success, is that Wright makes no attempt to cage or scrub that church influence from her vocals. 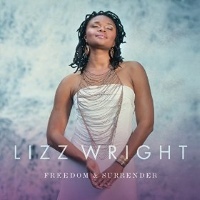 Listeners hear those influences whether Wright is singing gospel songs and spirituals on her 2010 release Fellowship, covering show tunes such as “As Soon As I Get Home” from the musical The Wiz on her 2002 debut album Salt, or being sensual and adopting a come hither tone on “Lean In,” a highlight from her latest recording – the excellent Freedom and Surrender. Now, I won’t say that “Lean In” is Wright’s play to get some love from R&B radio, because she’s already done things such as “My Heart” from The Orchard that drew on pop and Latin influences. Still, with a percussive keyboard intro that melds into a deep funk bass line, bluesy guitar riffs and Wright’s sensual and cooing vocals, it is the type of tune that deserves have a place on mainstream radio. Certainly, the song’s title shows that Wright, despite her rootsy persona, is definitely tuned into the cultural zeitgeist of the time. The term “lean in” has social currency due the book by that title written by Facebook COO Sheryl Sandberg, in which she encourages women to embrace challenge and risk in the workplace. Wright actually flips the concept by applying it to a romantic encounter where she encourages the man to free himself from his fear of rejection and act on his male intuition. Wright has had several notable collaborations over the years with artists such as Bernice Johnson Reagon, who achieved fame as one of the Freedom Singers from Albany, Georgia during the Civil Rights movement before she founded Sweet Honey in the Rock. That connection made sense because the two share their roots in the church as well the connection to Georgia. However, her duet with Gregory Porter on the ballad “Right Where You Are” is one that is both welcome and understandable. Like Wright, Porter makes no attempt to shackle or cage the church influence that came from his evangelist mother. The track features an arrangement where a jazz-influenced piano plays a prominent role and that provides ample space for both vocalists to display emotive vocal ranges – and that soars when the two sing in unison. Wright has achieved and maintained critical success and a loyal following by being true to her soulful roots. However, that does not mean that Wright is incapable or unwilling to branch out. She is equally at ease in the church house, the country road, the club, the bedroom, and places a little more intimate and romantic. You can take Freedom & Surrender about anywhere…and you will certainly want to. Highly Recommended.